The Tale of the Spirit of Money is the second chapter in Yoshi Topsy-Turvy. 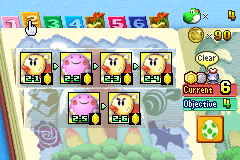 Before it begins, the Spirit of Greed will tell Yoshi that he loves money more than anything and that he needs four or more Happiness Medals in order to let Yoshi pass him. He will then ask Yoshi to bring him 60 coins. The first part of this mission is a short area containing a rolled-up carpet, a Fly Guy, and a set of spikes found underneath the area with a Heart found at the end of it. The second part contains some wall climbing, a few Shy Guys, and introduces the Basket. The third part introduces Balloon Yoshi and requires Yoshi to follow a trail of coins to the checkpoint warp at the bottom of the level. The fourth and final part contains wall climbing and a few staircases. The first part of this mission contains a Wrecking Ball and requires the player to use it to destroy a set of Stone Blocks that are blocking the way to the checkpoint warp. The second part has a few small slopes and rolling Igashira-kun as well as two Shy Guys. The third part contains two Lifts, a Yajirobē, a Piranha Plant, and some parachuting items. The fourth and final part has Yoshi climbing up a narrow wall pathway to the goal. The first part of this mission takes place in a red area and introduces the Shy Guy Ship. The second part contains three Cannons and requires Yoshi to shoot himself into some coins. The third part is an upwards area with some rolled-up carpets and spikes on the sides. The fourth and final part contains Balloon Yoshi and has him going down a corridor of spikes and Igashira-kun. The first part of this mission requires Yoshi to ride a Wrecking Ball to the checkpoint warp. The second part has Yoshi auto-climbing to the top of the area and then quickly falling while tilting the console to collect the coins on the way down. The third part has Yoshi riding a few sets of Chime Balls across some Chime Notes which all play Twinkle, Twinkle, Little Star. The fourth and final part introduces the Ferris Wheel and contains some parachuting items. The first part of this mission takes place on a yellow snowy mountain and requires Yoshi to slide down a short slope to the checkpoint warp. The second part has a Shy Guy Ship and an apple that can reached by tilting it in a full circle. The third part has a rolled-up carpet with spikes below and a large parachuting apple. The fourth and final area takes place on another yellow snowy mountain and has a few Lifts, Tap-Taps, and spikes. The first part of this mission takes place in a narrow pinkish area with a short wall climbing area upwards. The second part has a downhill slope and requires Yoshi to slide down while tilting the console in order to collect the parachuting coins. The third part has Balloon Yoshi and makes him go through a short corridor with a few Igashira-kun. The fourth area contains two Wrecking Balls which Yoshi must ride to the goal. This page was last edited on August 5, 2018, at 14:58.